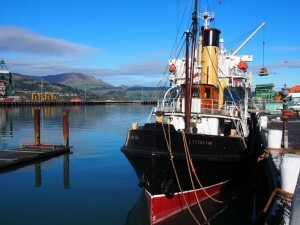 Hard frost, blue skies, Lyttelton market and a ferry crossing to Diamond Harbour, followed by good coffee and a walk around cliff edges watching birds and boats (and yes fresh fish off the boat as it came in). That was Cynthia’s take on the day on Facebook, and it’s a great summary of yesterdays Christchurch excersion. 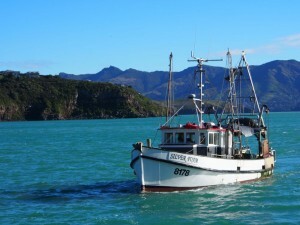 We had decided on a trip to Diamond Harbour as it is winter, and it is north facing, so would warm up during the day. 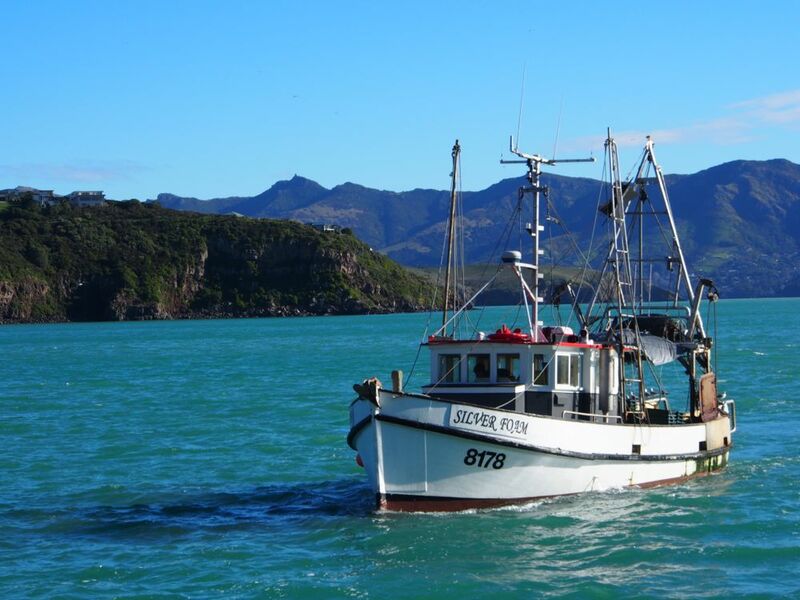 Saturday is a great day to go as you can catch the excellent Lyttleton Farmers Market – we filled up our bags with goodies for the week – luckily there is an ATM on the street if you have forgotten your cash. They had some great buskers which added to the colour and atmosphere. 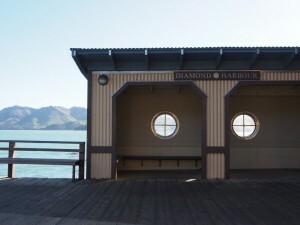 Diamond Harbour is a short ferry ride from Lyttleton, the largest port in the South island with Black Cat – who also do cruises in Lyttleton and Akaroa which are highly recommended. On the way over, a local tells us that the name is from the angle of the sun on the water creating as sea of diamonds. We walk up the hill – not great signage here, but we discover there are a number of routes we could have taken – we opt for straight up the road .5 km uphill walk. At the top a welcome cluster of shops offer two coffee options, we opt for the Godley Café for sentimental reasons – the original Godley House crumbled in the 2011 earthquakes. We had some fantastic coffee and I had an excellent Breakfast – Tradies Breakfast of mushrooms, chorizo, scrambled egg, bacon and ciabatta – only $12 midweek. 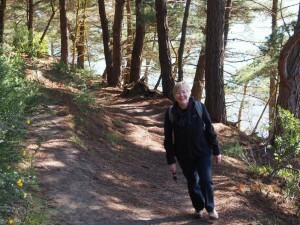 We decide on the Cliff Track back to the Ferry. Some major storms have brought down a lot of trees, which are clearly still being dealt with – part of the track is still closed and the one we went on had a huge stump of a tree in the middle of the track that we had to work our way around. 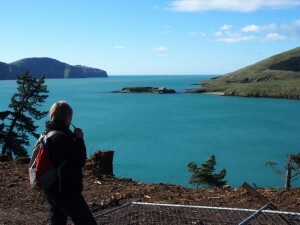 However it was a pleasant walk was through old pines, but as promised it followed the Cliff and had wonderful views back to the sheltered Purau cove and out to the Heads of Lyttleton Harbour, where we could see the container ships and their escorting tugs coming and going. As we arrived at the Ferry, a fishing boat came in and the locals started to arrive – a phone tree operates to let people know they can come down and buy fish off the boat. We manage to buy 3 gurnard – whole but gutted which we cooked whole that night. What a treat – fresh from the sea. A great way to finish the day. 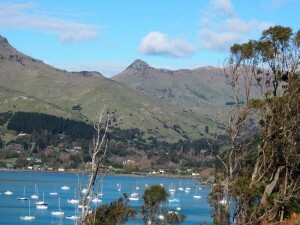 Drive to Diamond Harbour – from Lyttleton 44 minute drive around the Harbour, not so far if you go over Dyers Pass Road from Christchurch. IF you drive you could go further up to Port Levy.